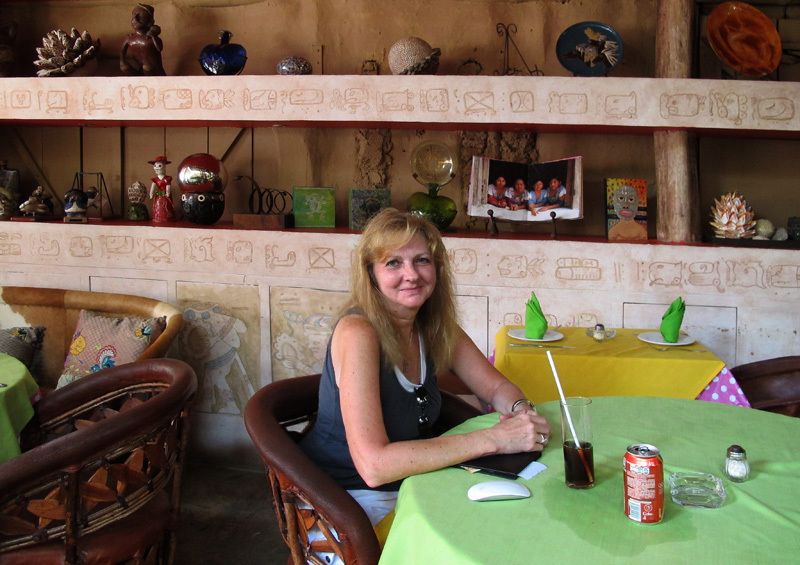 I thought I would do several posts on Tulum rather than one long one. 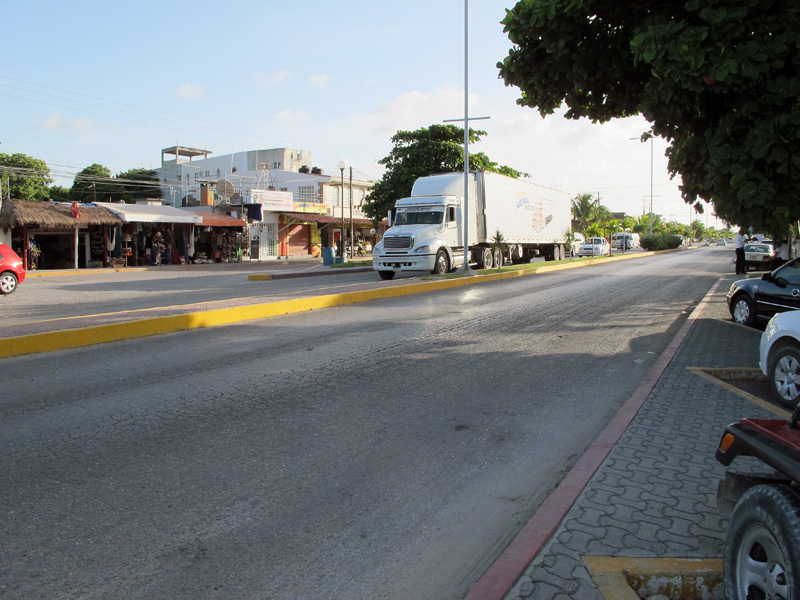 The strange thing about Tulum is that there are actually two areas…the main town which sits right on the highway…and the hotels and beach areas that run along the coastline. They are not within walking distance of one another which is kind of a shame. 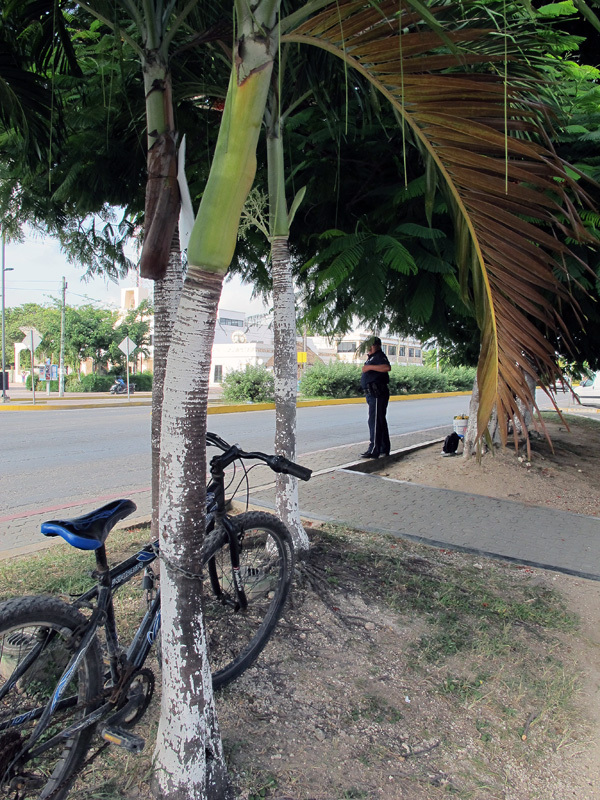 It is at least a five minute taxi ride to get from the town to the beach, depending how far you are going down the coast and costs about 50 pesos for the ride. 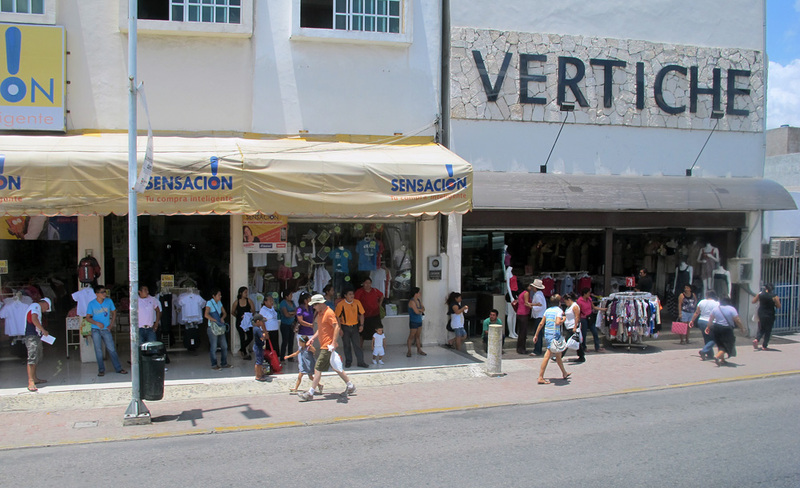 First, I started out the day in Playa del Carmen. 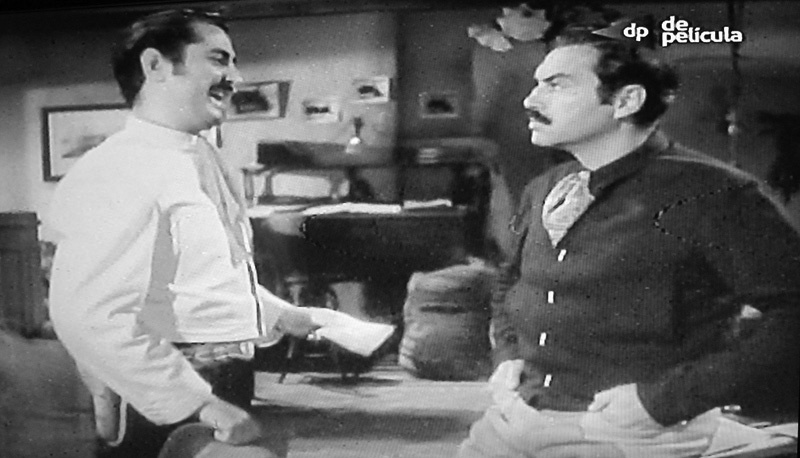 When I’m in Mexico, I always like staying in hotels that have cable TV. I don’t watch a whole lot of TV when I’m there, but when you travel alone, it’s always kind of nice to have some chatter in the background. 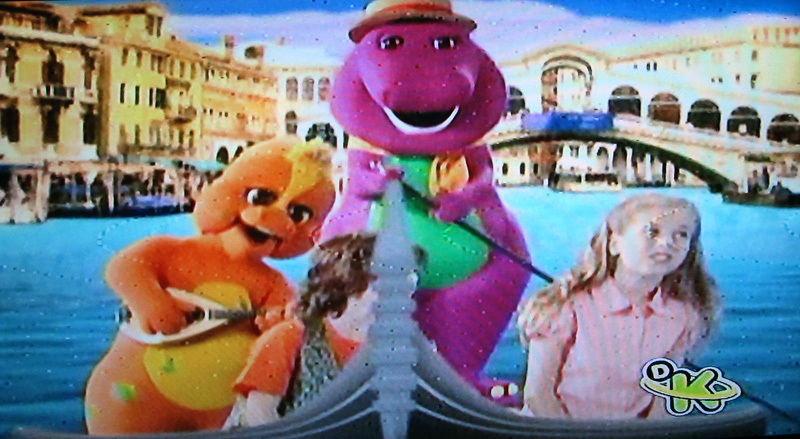 It’s kind of interesting to flip channels…did you know Barney speaks Spanish? And it looks like he’s in Venice, so he must speak Italian, too! 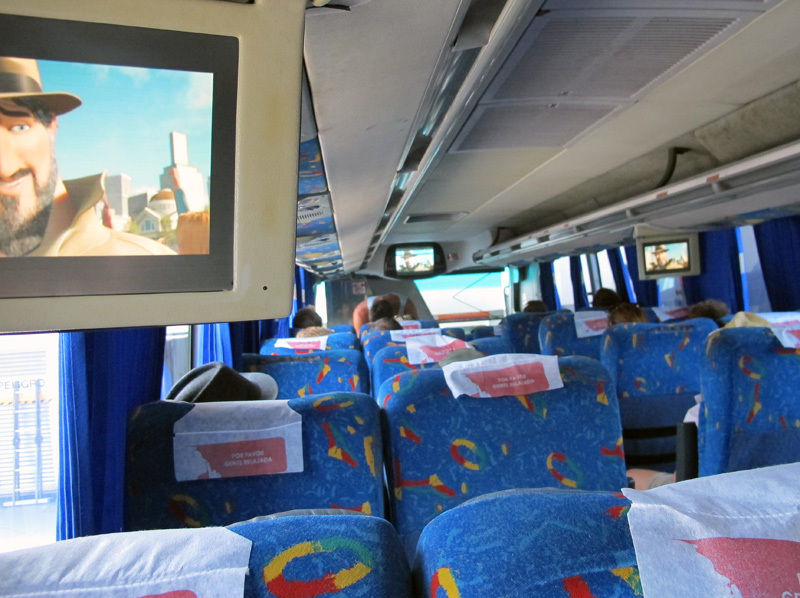 Personally, I only like to watch de pelicula which shows old Mexican movies. They’re silly, but for some reason, they make me feel at home…I have no idea why. The waiter just grabbed my camera and took a picture. 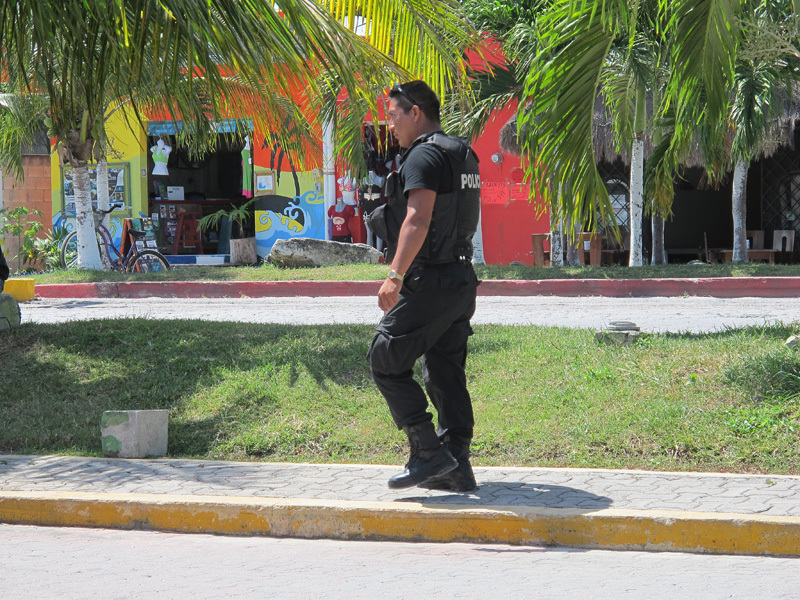 All the waiters are always so nice in Mexico. I don’t think I’ve ever had a single instance when a waiter hasn’t been. However, I didn’t take a picture of breakfast this morning because it was one of the worst breakfasts I think I have ever had in Mexico. I just had eggs with potatoes and sausage. You wouldn’t think that would be too hard to screw up, but it was really bad. The potatoes were just like a McDonald’s hash brown patty and the sausage was a mediocre hot dog cut in half length-wise. Yikes. I don’t think I’ll be visiting this establishment for breakfast again. 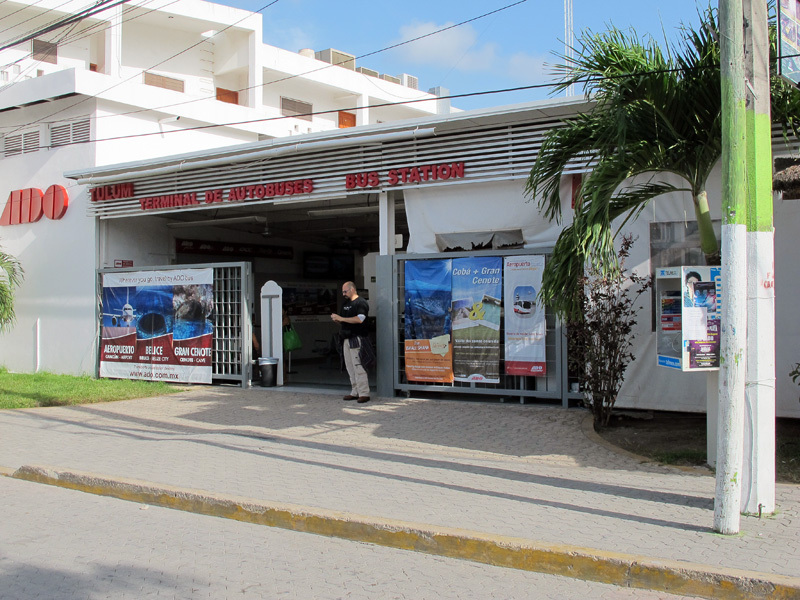 Time to head to the bus for Tulum. I don’t follow Disney cartoon movies, so I don’t know what was showing, but it’s kind of funny to see these dubbed in Spanish. 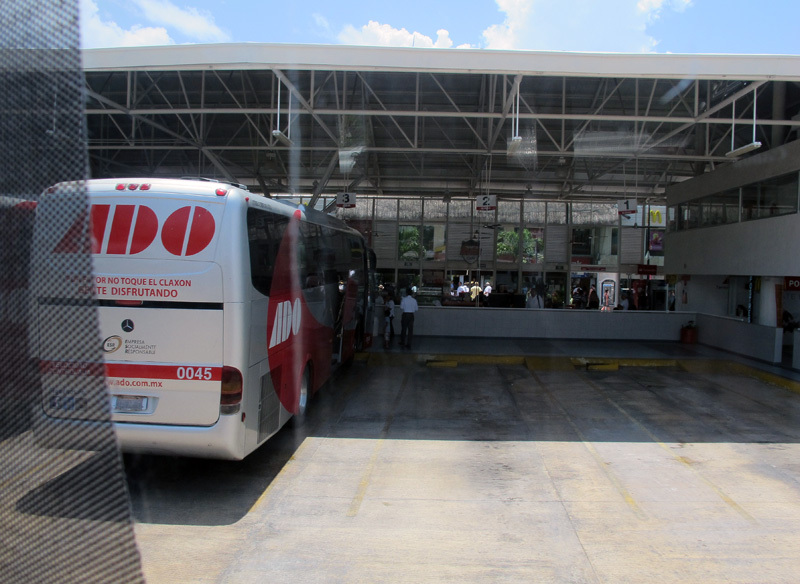 Here we are backing out of the bus station. I will have to say the bus drivers of these big buses are very skilled in maneuvering around tight places. For one thing, the parking spaces in these stations don’t leave a whole lot of room in between buses, so that alone always impresses me. 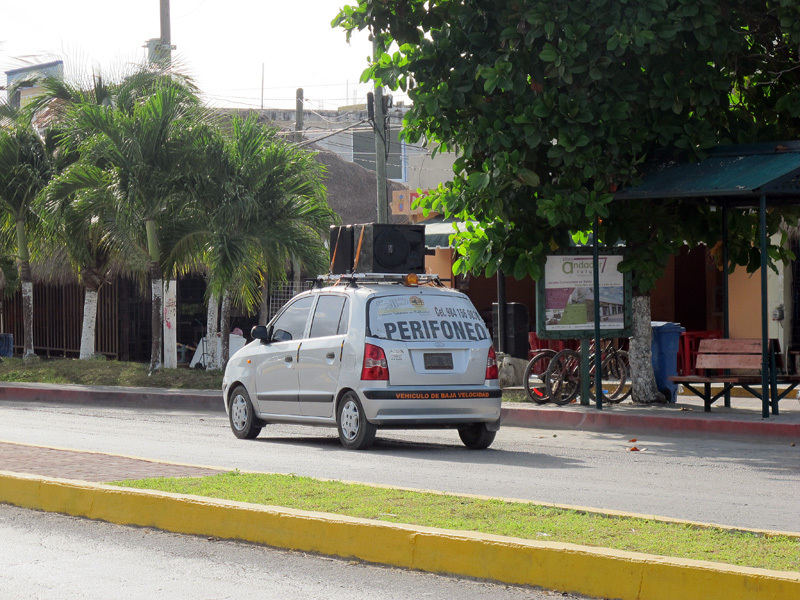 But seeing these huge vehicles turn sharp corners in very tight, crowded Mexican towns just amazes me. 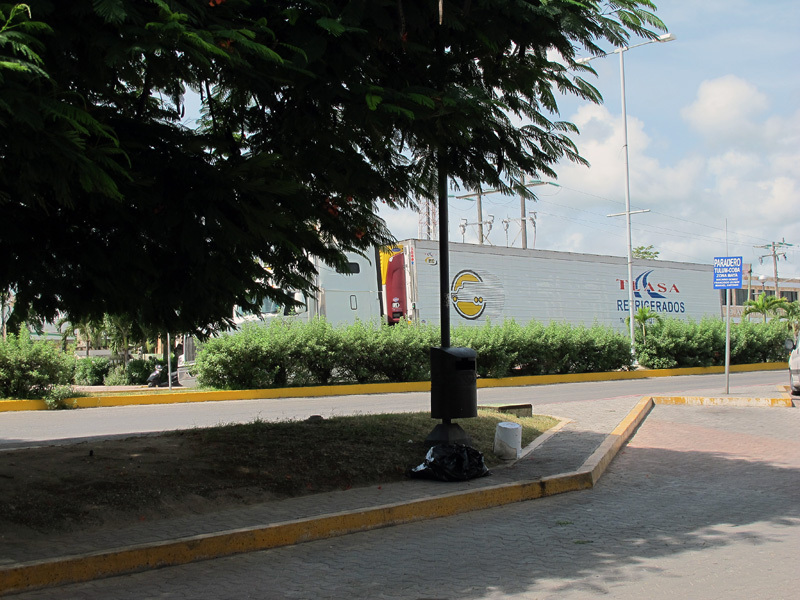 This was particularly evident when I was to Vallodolid. Some of those streets were extremely narrow and cars were parked along the sides. It’s amazing that these guys don’t run into something once in awhile. I give them lots of kudos. There’s nothing really to take pictures of along Highway 307 when you’re going down the coast line. The road is too far away from the shoreline to see, and all the hotels and attractions are tucked back from the highway, so you can’t really see anything along the way. 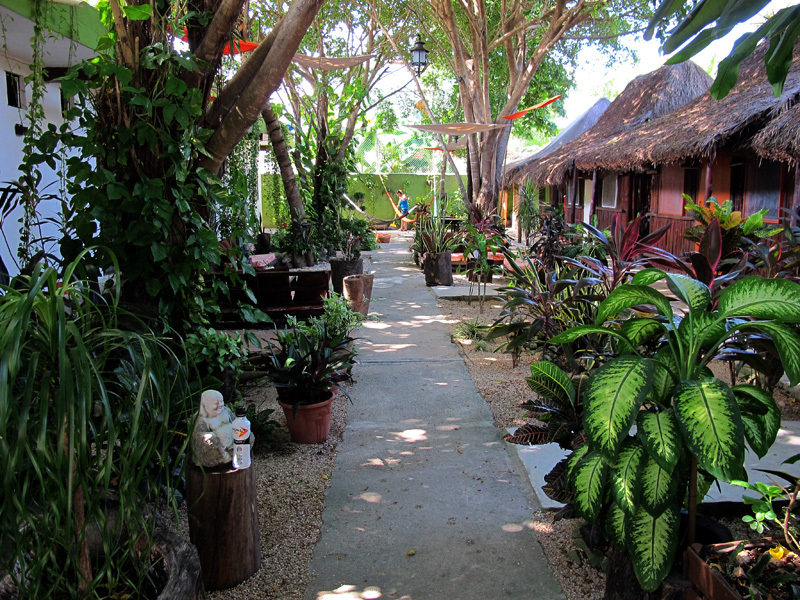 And here’s my hotel in Tulum…the Secret Garden….which I was pretty disappointed in and would never stay at again. 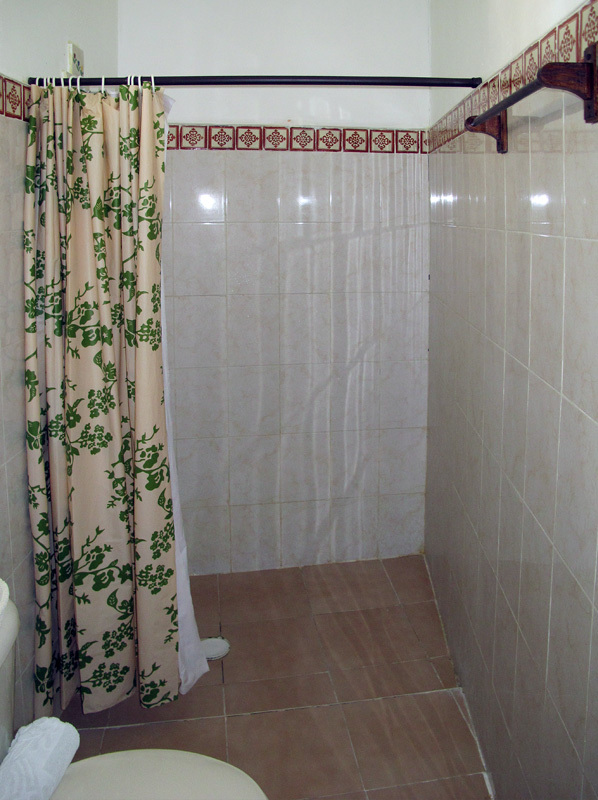 Here’s my room which was right next door to the check-in area, so I never felt like I had a whole lot of privacy. 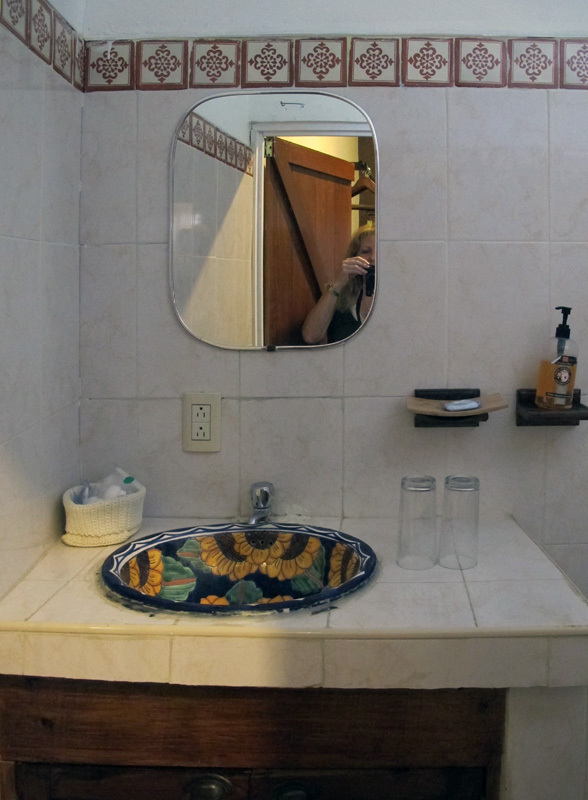 Besides that, I normally don’t mind when a room is small, but this one had a very claustrophic feel to it. 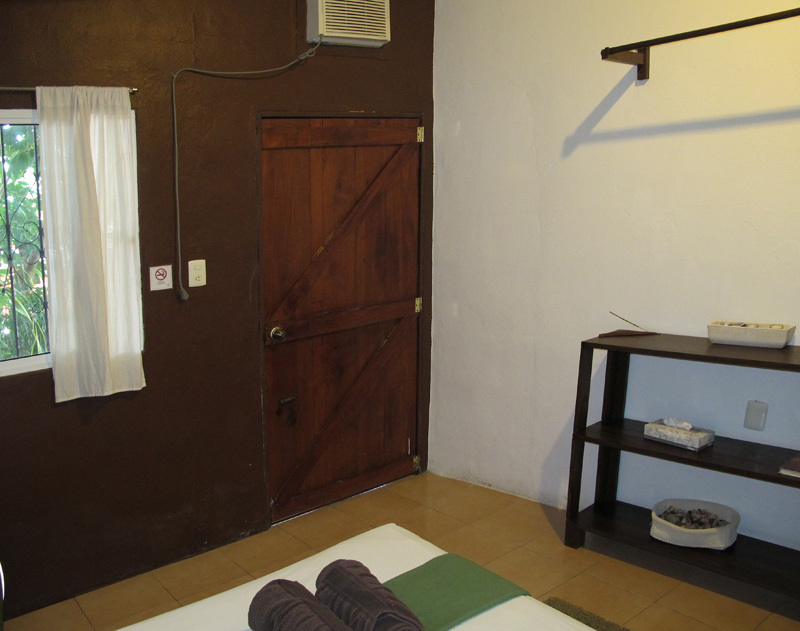 Here’s the center courtyard between the two rows of rooms. One evening, I decided to take my laptop out there to do some blogging while another couple was relaxing. As I stepped over to one of the benches, I said, “Do you mind if I join you?” Neither one said a word. I thought maybe they were foreigners and couldn’t understand me, but you would have thought they might have said some kind of greeting. Anyway, it was REALLY dark out there and I had to rely on the light from my laptop in order to see where to sit. It seems like they could have had some dim lights out there or something so you didn’t trip on anything. So I sit down on the bench and start working on the blog when I suddenly feel/hear something “land” on the bench next to me. I couldn’t see anything in the dark, so I kind of felt around on the bench next to me to see if there was something there. As I write this now, though, I can’t even believe I did that! What if it had been a scorpion…or a snake!! And here I’m trying to feel what it was?? Really, Deb? Feeling rather uncomforable because of the mute fellow hotel guests and my unknown bench occupant, I left pretty quickly to return to the safety of my claustrophic room. 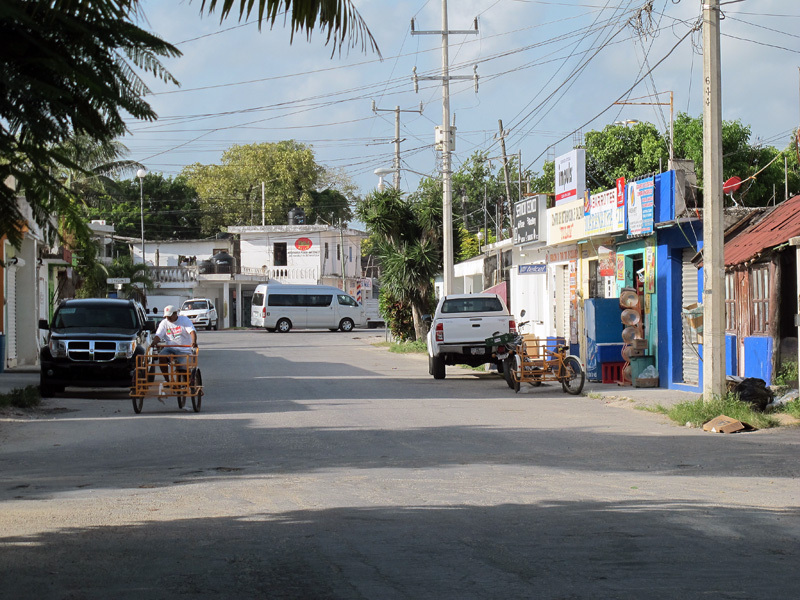 So, on to the town of Tulum. 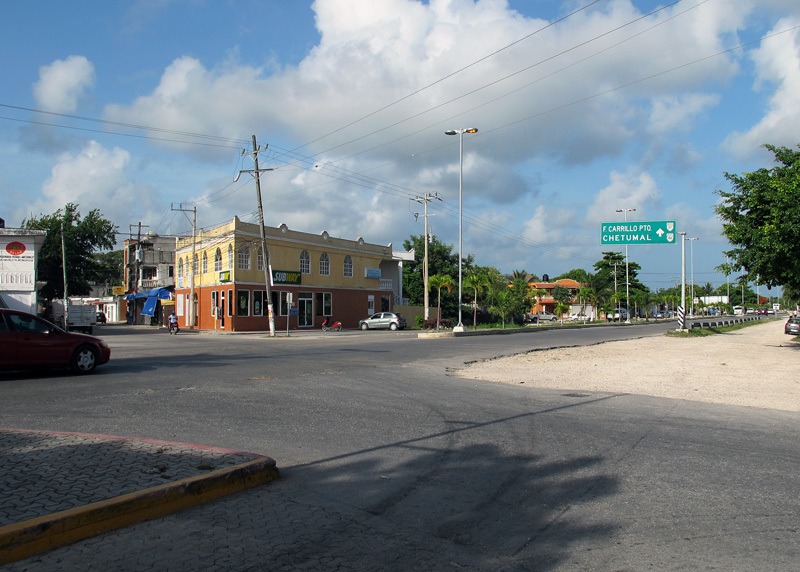 It sits right on Highway 307 which runs from Cancun to Chetumal. Because it is the main highway between those two locations, the traffic can be pretty noisy and hectic at times. Huge tractor trailers come through all the time…and many of these are semis pulling another full semi behind. Because of all this traffic, they have guards that stand on the main intersections who stop traffic so that people can cross the street. That’s definitely a good idea and makes things much safer. Here’s the place where I rented my car. If you would have told me 10 years ago that I would be renting a car on my own in a town in Mexico from a little hole-in-the-wall place, I would have told you you were crazy. Now maybe I’M the one who’s crazy…haha! 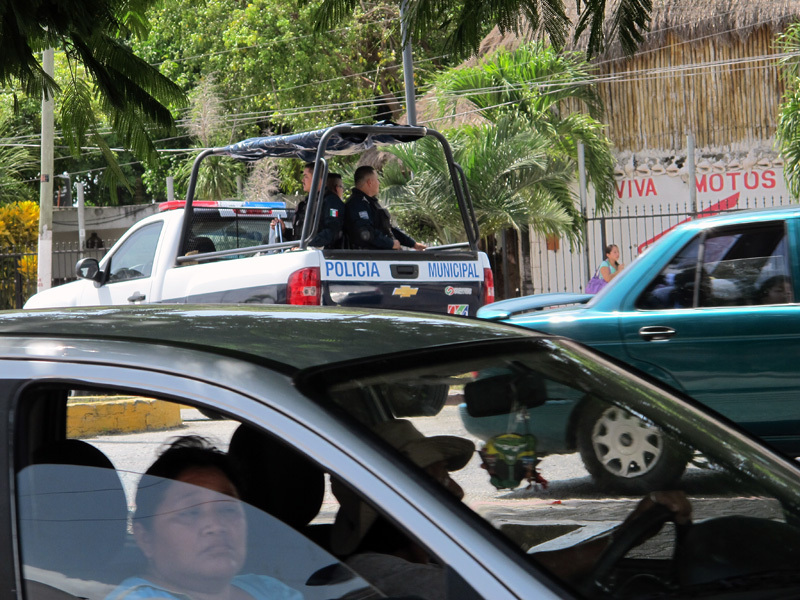 You see police trucks circling the town quite often with officers in the back. 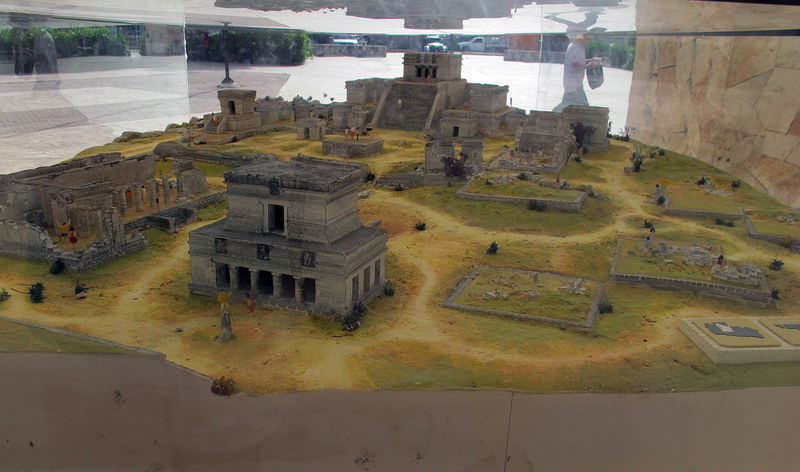 They had a model of the Tulum ruins enclosed in a big display case. I didn’t go to the ruins this time, but have been there before. You can check out that visit here. Here’s just a typical street scene around the corner from where I was staying. 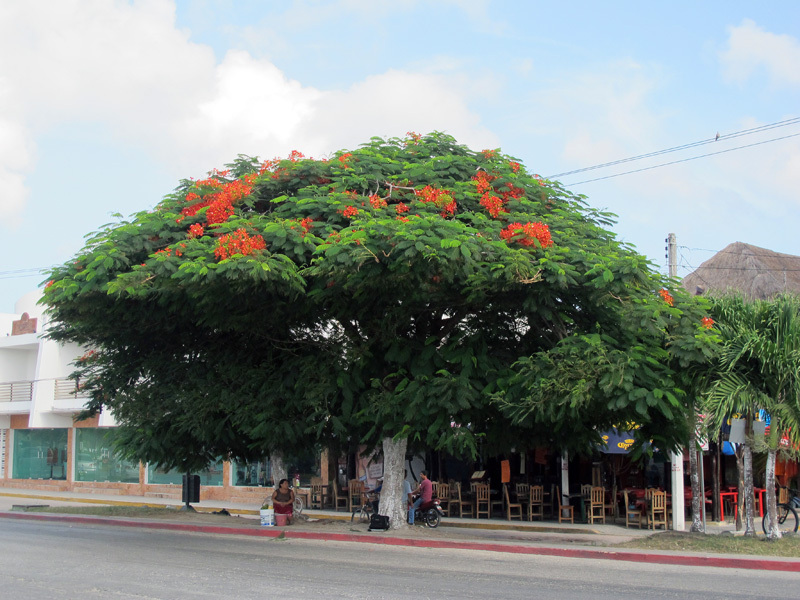 This tree is called a Pride of Barbados. They have these in Texas, but they are only bushes…they aren’t huge trees like this one. They are all over Mexico and are just beautiful. They clipped this one to accommodate those big semis going through town. Had to share this sign I saw on a store window. 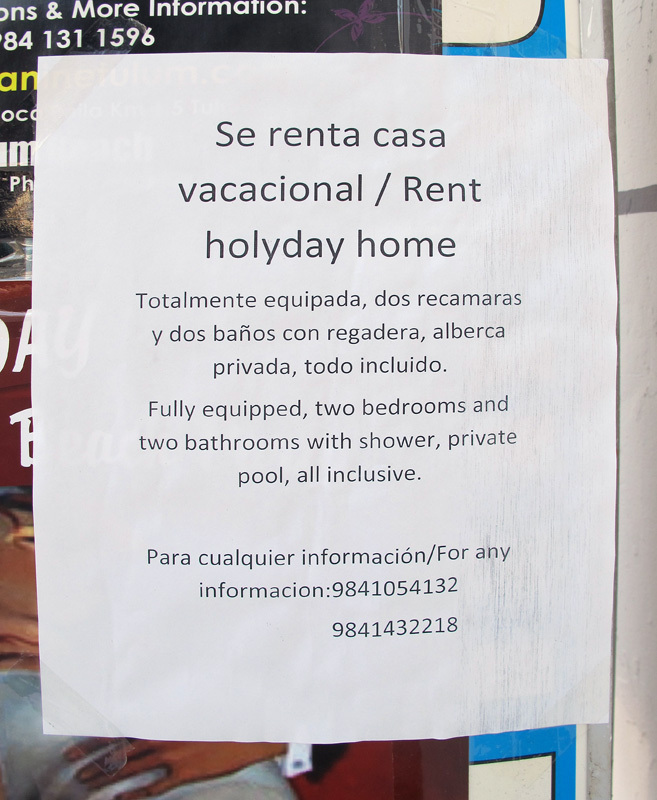 A “holyday home”…hahaha! 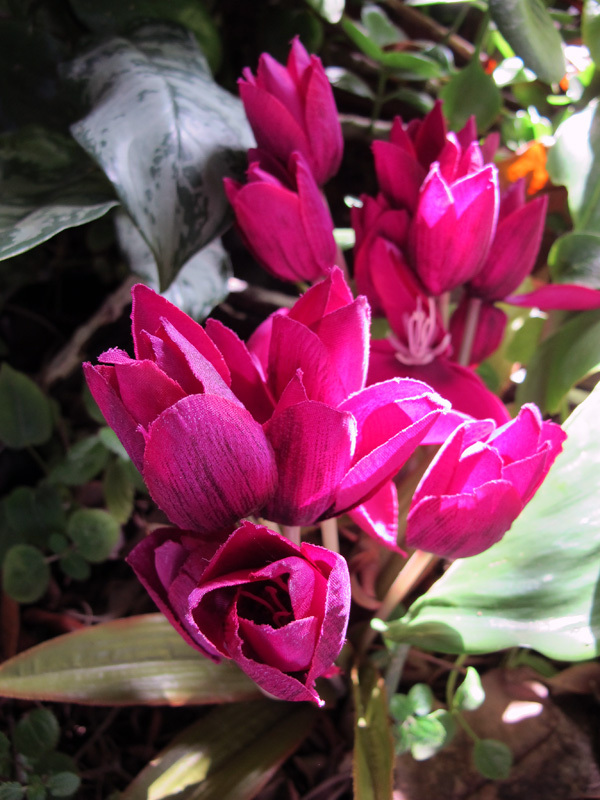 I’ll end this post on some beautiful flowers growing at my hotel. More on Tulum to come. 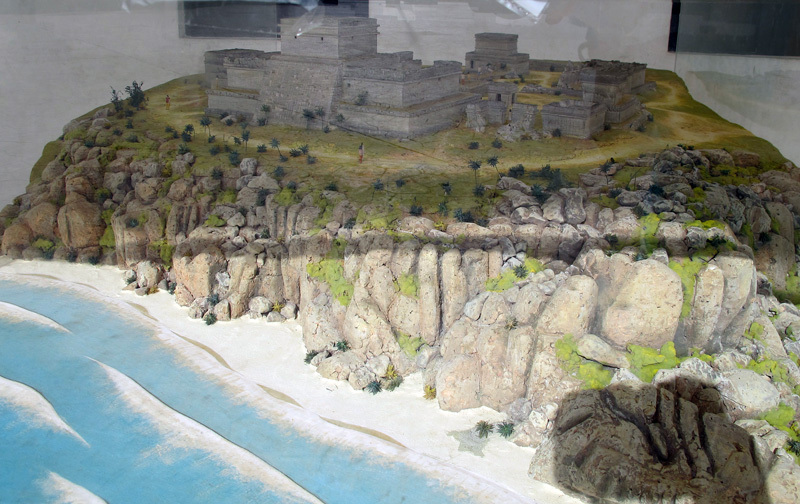 This entry was posted on August 16, 2012 by EditorDeb. 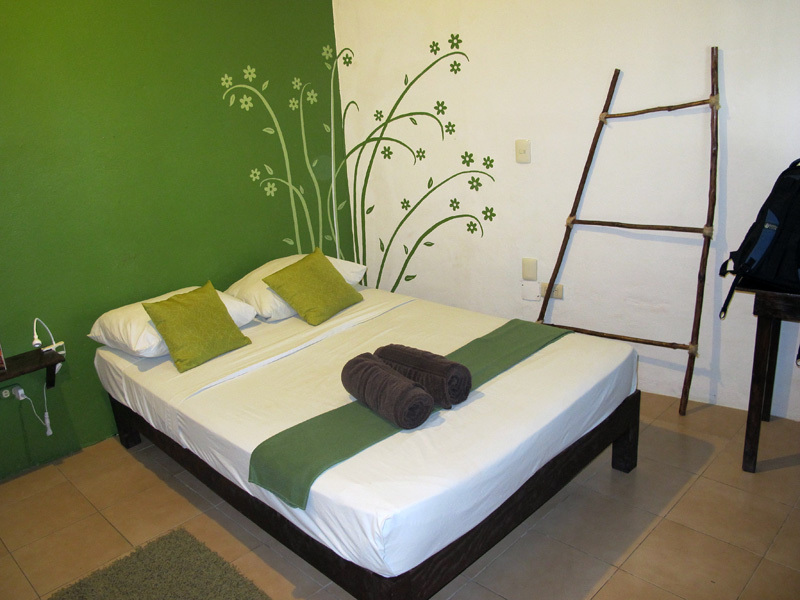 It was filed under Busing, Hotels, Tulum, Uncategorized . Thanks for sharing Deb. 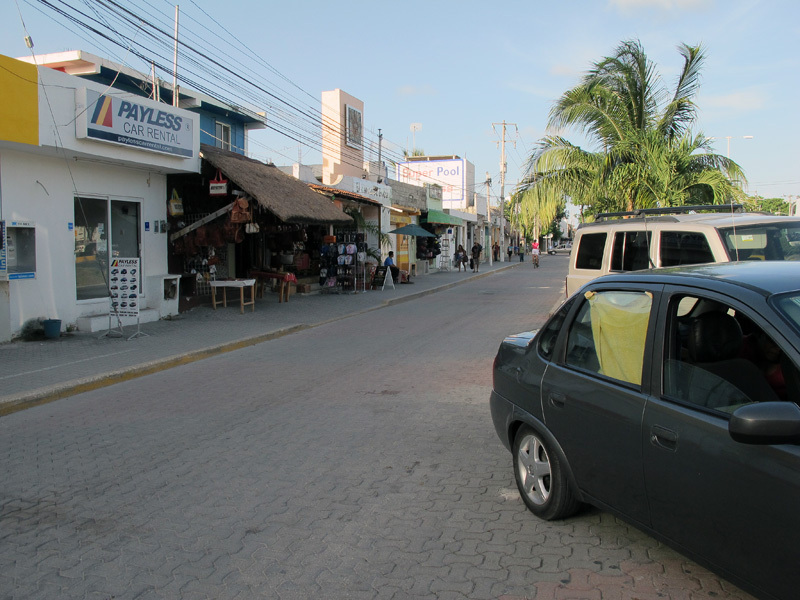 We were in Tulum and Palya Del Carmen in the mid 90’s–they both have changed quite a bit since then! It was pre ditial camer days & we lost our roll of film with all the pictures of Tulum off the ferry we were on ( went on an excursion from a cruise). 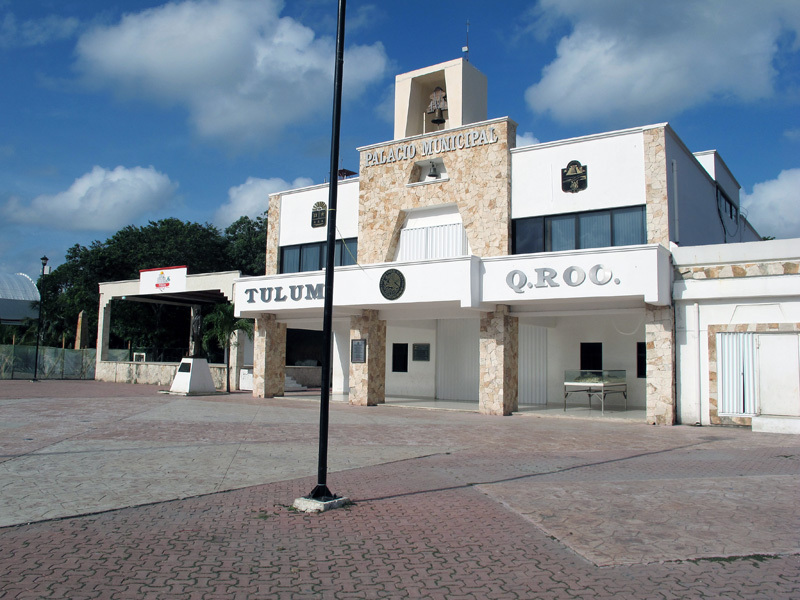 We took a collectivo from PDC to Tulum back in 2004 to see the ruins, so I’m seeing what we missed in the town! I had the same experience with a couple we kept running into in Belize. We were on a boat with them for an entire day to Lamanai ruins and they were extremely unfriendly, then a few days later we ended up crammed into the same puddle jumper plane with them back to Belize International. We had to climb over them to get into the seats in front of them on the plane. And, of course, they acted like they didn’t recognize us and couldn’t respond with hello. Just weird. I also thought maybe they were European and didn’t speak English, but they were from California. Maybe raised by wolves? Sorry to hear about the film roll loss, Ann. I would rather have lost a film roll, than a camera, though. My G12 is still sitting in rice. I don’t hold out much hope, but it’s worth a try. “Maybe raised by wolves?” Haha, Beck! Isn’t the truth, though? You’d think they could at least grunt a response.